What Do you Think of the Colorful Couch Trend? For the longest time, we’ve had a neutral couch (tan, light grey, cream, etc) – both at home and at the studio. 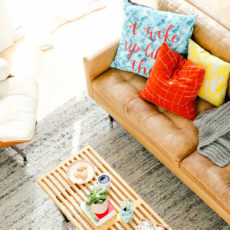 But I’ve always wondered whether I should dip my toe in the colorful couch trend that Pinterest can’t seem to ignore. There are a few couches / sofas (whatever you prefer to call them) that have really caught my eye. But I’m just not sure I can pull the trigger because I often like to change up the look of a room and without a neutral couch, I wonder if things will always just kind of look the same? What are your thoughts? I’d love to hear your opinion. Let’s go through the rainbow and figure this out, shall we?! Mustard yellow seems like a good in-between option. It’s colorful, but still feels neutral because of it’s proximity to tan, etc. I love the shape of this couch too! Via Copy Cat Chic. 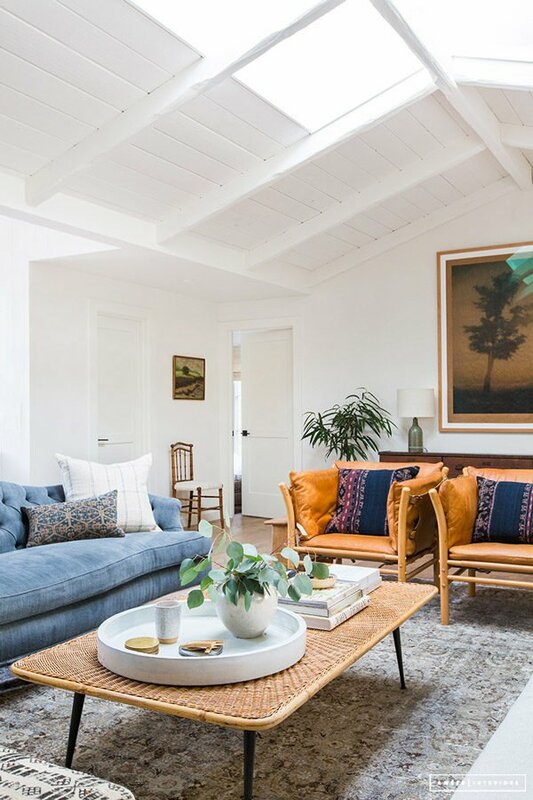 What do you think of this sky blue sofa popping out of the corner of this space, designed by Amber Interior Design? I like it…especially against the more neutral backdrop of those leather chairs and natural coffee table. 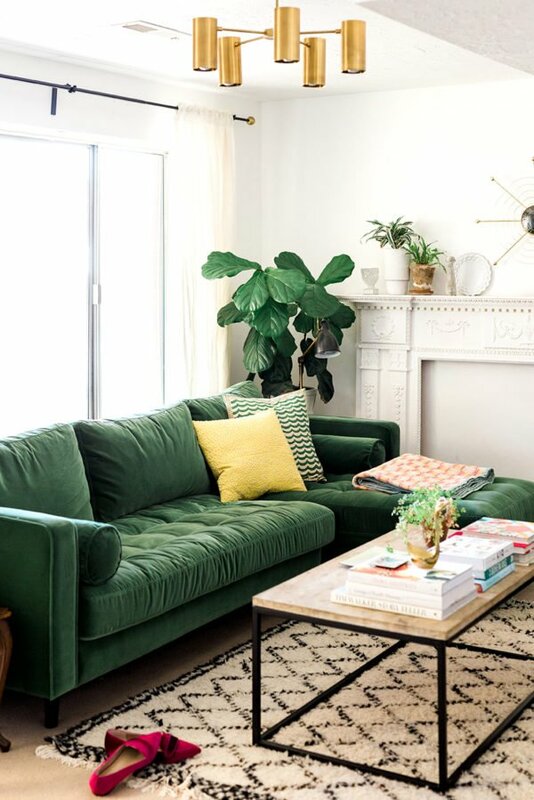 This green sofa from The House that Lars Built is definitely a bold pop of color! And since the rest of the space is pretty neutral, the room feels balanced, not overwhelmed by the color. 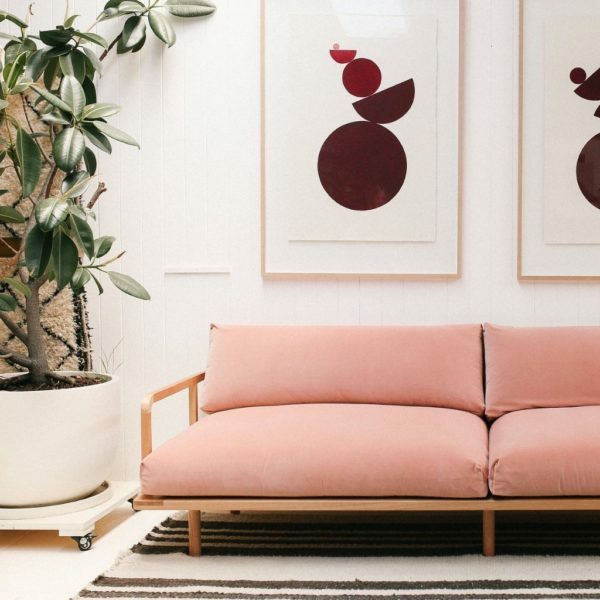 This dusty pink sofa from Pop and Scott has always been a favorite of mine. Definitely a pop of color, but again, still feels kind of neutral somehow. 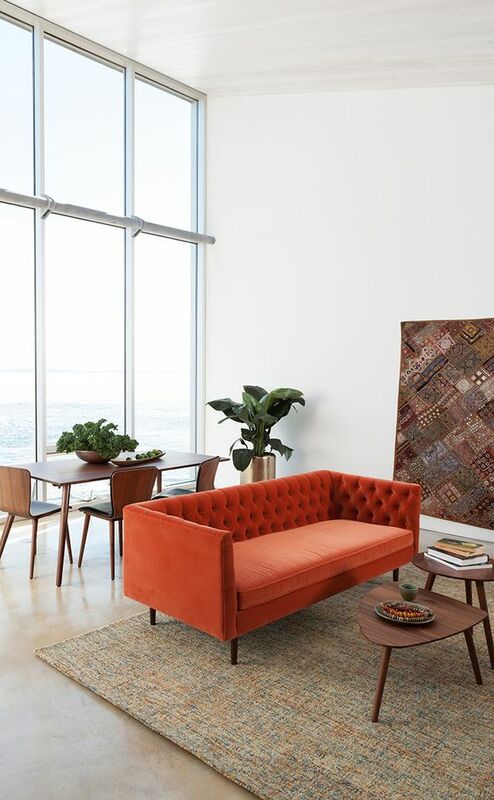 Persimmon orange is never a color I thought I would like for a couch, but this one (from Article), is really gorgeous. Lilac! 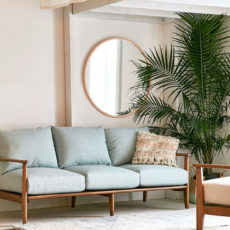 This pretty pastel looks surprisingly good on this sofa from Urban Outfitters. Okay, so now that you’ve seen some examples, what are your thoughts? What do you think of the colorful couch trend? And would you ever buy a colorful couch for your own home? The trend is awesome! I love pink couches specifically, i want one. All the color everywhere, please! Oh wow! That is super bright and cheery, Elle. Thanks for sharing. I’ve had a green one myself in my first apartment, so I’d go for that! But I also like the red one, it’s such a statement! Thanks for chiming in Michelle. I love colored couches! We have a sea green colored couch and down the road I would love to get a navy or green velvet couch! Cool! Thanks Felicia. Sea green sounds pretty. Thanks so much for weighing in Julie. I’ve always wondered if you grow tired of the couch color if it were very opinionated. Thanks for sharing your thoughts! Super helpful. I have a turquoise couch, which is super cheery and I love it – but wish I had gotten a neutral instead. This is largely because since I bought it, I moved to NYC and currently live with a roommate. If I get a place of my own, it will likely be a studio, and my couch clashes with my bedroom stuff (which is orange and white). Thanks for weighing in Etta. Yep, that seems to be the dilemma of the colorful couch. It’s cheerful and lovely, but is it practical? Not sure. 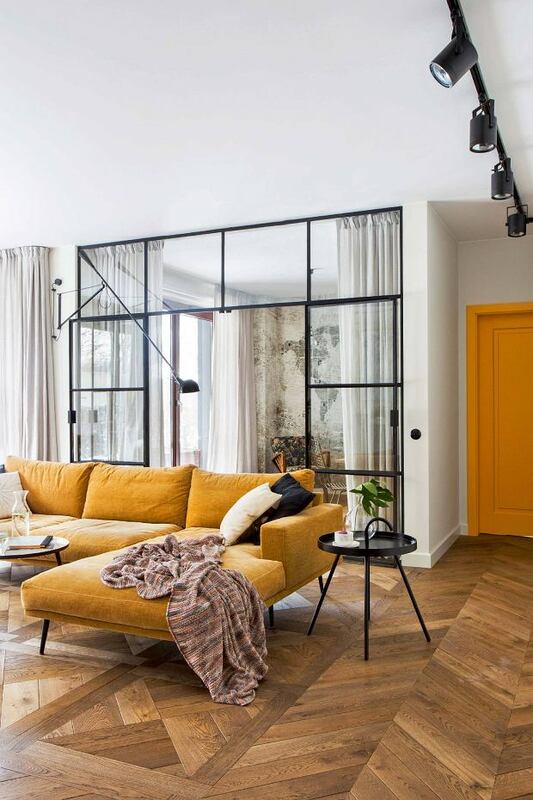 I love the mustard yellow sofa in the top photo, but after clicking around, I can’t seem to find who manufacturers it. Can anyone offer any help? I like most of these, but love the mustard and green ones, particularly the green. (But those are my two favorite colors!) I love color and have learned that if I find a colorful item that I really like, I don’t grow tired of it. I have moved items from room to room for a nice change.